As I work on my digital collages I am reminded of Clement Greenberg's essay on collage: "The Pasted-Paper Revolution" (or as it is known "On Collage"). Greenberg's article is still amazing. In it he discusses a number of cubist works by Braque and Picasso. In the Autumn of 1912 Pablo Picasso began a series of works using a range of materials such as wallpaper, imitation wood grain, newspaper, a charcoal drawing and sheet music. 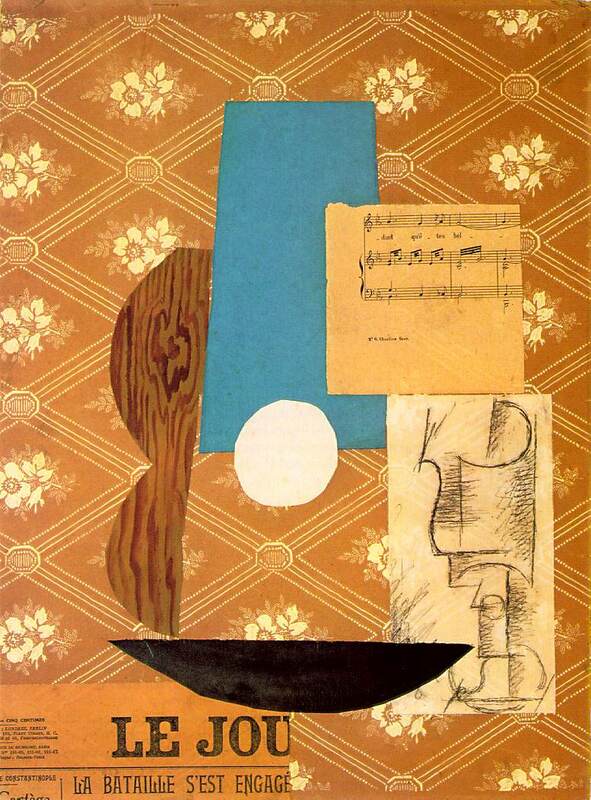 This is one (above) of the earliest collages and perhaps even the first. Clement Greenberg in his "The Pasted-Paper Revolution" of 1958 argued that pictorial allusion gave way to what he called an optical illusion. In his sophisticated formalist reading of the work he argued that the various elements, the lettering, the charcoal lines and the coloured papers "begin to change places in depth with one another, and a process is set up in which every part of the picture takes its turn at occupying every plane, whether real or imagined, in it." Frascina, Francis and Harrison, Charles (1987) Modern Art and Modernism: A Critical Anthology New York: Harpers and Row pp.105-108. On the new pics: previous post.